Enron Corp. founder Kenneth Lay received a barrage of written warnings from employees questioning the energy giant's accounting integrity in the fall of 2001 but said on Monday that he was too busy trying to save the company to investigate. The ex-chairman was combative during his fifth day on the witness stand in his fraud and conspiracy trial, accusing a federal prosecutor of highlighting only negative information. "I didn't have that luxury (of hindsight) when I was right in the middle of battle," Lay protested. Prosecutor John Hueston, in his third day of cross-examination, sought to show that Lay ignored warnings of accounting impropriety and financial doom after resuming as chief executive upon the resignation of co-defendant Jeffrey Skilling from that role in mid-August 2001. 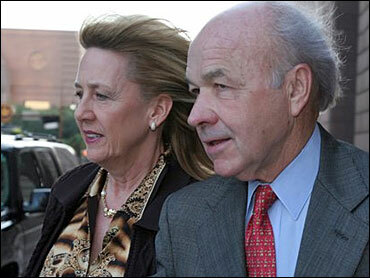 Enron, once the seventh-largest company in the U.S., filed for bankruptcy protection in December. Yet in November 2001, with Enron's stock and reputation already in the tank, Lay told employees he could "not have ever contemplated" what lay ahead for the company and its stockholders. As he did last week, Lay bristled and bickered, claiming he had received positive information along with negative. One warning came in October 2001 via an e-mail from Jim Schweiger, a longtime trader, three days after Lay announced a massive third-quarter loss and $1.2 billion write down in shareholder equity. The bulk of the losses had been triggered by the unwinding of financial structures, run by former Chief Financial Officer Andrew Fastow, that prosecution witnesses testified were used to hide faltering businesses and boost earnings. "The fact that senior management and the (Enron) board of directors knew these transactions were being used to manipulate earnings and the stock price, and took advantage of that knowledge to sell their ENE stock options, in my opinion, is CRIMINAL," according to Schweiger's e-mail, which was displayed on a large screen, portions of it read aloud to jurors. If Lay was going to "play the game of lying, cheating and stealing," he should have a "plausible story," the e-mail said. Lay bristled when Hueston pressed him on why he didn't investigate Schweiger's allegations. "I was getting information from all sides, Mr. Hueston," Lay said. Schweiger's Oct. 19, 2001, e-mail also alluded to the millions of dollars Fastow had earned from the partnerships. Lay waited until the next week to assign two directors to ask the CFO about it after regulators had already launched an inquiry into it. Fastow was eventually fired over the amount he pocketed from the partnerships. As early as September, The Wall Street Journal also asked how much money Fastow earned from the partnerships. Lay reiterated on Monday that he had refused to answer those questions at the behest of Enron public relations officials and did not himself ask Fastow about the earnings. Lay sneered that it was easy for the prosecutor to second-guess his decisions. "The corpse is on the gurney now, Mr. Hueston, and you're carving it up any way you want to carve it up," he said. Lay and Skilling are accused of repeatedly lying to investors and employees about Enron's financial prowess when they allegedly knew accounting tricks that hid bad news and inflated profits. "I'm sure Lay's team would tell jurors that their client would rather be believed than beloved when his testimony is through," says CBS News legal analyst Andrew Cohen. "And I also would imagine the prosecutors are going to portray Lay's stridency on the stand as the mark of someone who was too passionate about Enron not to have known about the fraud that went on there." The two men counter that no fraud occurred at Enron other than that committed by a few executives who stole money through secret side deals. They attribute the company's descent into bankruptcy proceedings to a combination of bad publicity and lost market confidence. While former Enron executive Sherron Watkins famously warned Lay in late August 2001 that Enron could "implode in a wave of accounting scandals," Hueston showed she wasn't alone. Former Enron Chief of Staff Steve Kean told Lay in an August 2001 e-mail read in court Monday that the company's indecipherable financial disclosures could attract accounting scrutiny. Unnamed employees wrote in a September 2001 survey that Enron needed to rely less on "accounting trickery" and more on business operations to meet earnings; transactions were "designed to deceive the investing public and nothing more," and "nothing is more frustrating than listening to outright lies from none other than our Chief Executive. I never thought I would say that about Ken Lay." "Sir, those are frightening allegations, aren't they, Mr. Lay?" Hueston asked. "No, that wasn't frightening to me, Mr. Hueston," Lay replied, noting he was most concerned about Enron's falling share price. He said he and other top executives had to prioritize what was urgent when sifting through mounds of information. After Hueston finished initial cross-examination, Lay lawyer George Secrest asked whether the September 2001 survey brought in positive responses as well. "Basically it's a mixed bag, is it not?" Secrest asked. "Yes it is. We had over 3,000 responses," Lay replied. Lay was expected to wrap up his testimony Tuesday. Lay also acknowledged under Hueston's questioning that he and his family maintained their extravagant lifestyle in 2001 despite his insistence that necessity had driven him to tap Enron for more than $70 million in loans to repay personal debt. Lay had collateralized his personal debt primarily with Enron stock. He told jurors last week that as the share price fell throughout that year, his lenders issued margin calls for immediate repayment. Lay said he got cash from Enron to repay his personal debt, and then repaid Enron with stock. But Hueston questioned why Lay didn't first sell stock in other companies he owned or properties on the Texas Gulf Coast or in Aspen, Colo. Lay retorted that non-Enron stock made up about 10 percent of his holdings, and real estate sales could take too much time. Hueston also gave jurors a further glimpse of Lay's former lifestyle, which in the first half of 2001 included chartering a boat for $200,000 for his wife's birthday party, $4,700 for a two-night hotel stay on the French Riviera, and $12,000 for his own birthday party at a resort. "We could have reduced some living costs, but as I said earlier, we had realized the American dream. We were living a very expensive lifestyle. It was difficult to turn off that lifestyle like a spigot." After Lay leaves the witness stand, four character witnesses are slated to testify on his behalf: Houston Astros owner Drayton McLane, the Rev. Bill Lawson, a prominent Houston leader and friend, Retired Adm. George E.R. Kinnear Jr., who was at the Pentagon more than 30 years ago, and former Houston Mayor Bob Lanier. Then a string of experts are slated to testify on behalf of both defendants. Skilling faces 28 counts of fraud, conspiracy, insider trading and lying to auditors, while Lay faces six counts of fraud and conspiracy. Lay also faces a separate trial on bank fraud charges unrelated to the current trial. That case will be tried before Lake without a jury during deliberations in the conspiracy case.